I Hope You LOVE Bacon. I Already Know You Love Shakes. 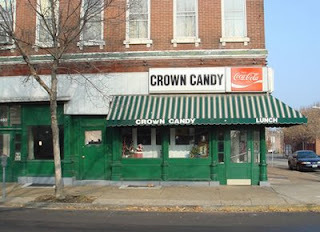 Somehow, someway, it has taken me this long to hit Crown Candy Kitchen up there in Old North St Louis. And the sad part is I had read about it for months before I moved here. Maybe it was that I had failed to ask anyone to show me where it's at, or the fact that everyone tries to scare you to death about going North of Delmar for fear of being gang-looked-at. I know getting gang-looked-at (being looked at by someone you don't know who's "scary") can really freak someone out, but the North side was more abandoned than wrought with early 90s Snoop Dogs. THAT would have been awesome. Those cars bounce! It was sad to see all those historic buildings abandoned and in ruin, but it did make the drive to Old North extremely quick. The whole area seems like it could be a new Soulard actually. I know I've read accounts of what Soulard was like in the 70's and what I saw on the North side was the real-life version of it. Perhaps there is hope there. As I pulled up to Crown Candy Kitchen I did see signs of it. 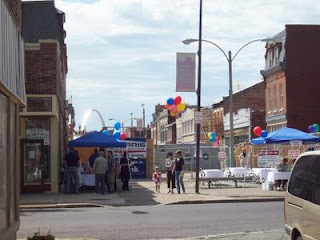 It looked as though there was plenty of rehab going on to store fronts right around the immediate area. As soon as I saw it I was reminded of a story I read about the restoration of a North side street mall and I was sure this had to be it. I googled a little bit since then and it seems as if the area will be called Crown Square. I like it! Even more impressive is what the plans are proposing. It sounds like Old North could really become an art center for St Louis. Well, I can tell you this much... The buildings are on their way. 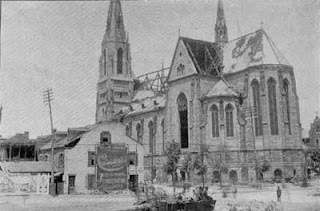 The street was full of construction with a few buildings seemingly ready to occupy. In fact, it looks as if the whole area as a whole is ready to explode onto the scene. Check out the goings on of Old North in this blog. What they are doing is pretty impressive. Revitalizing a whole area takes patience and balls. Not necessarily in that order. Apparently it also takes bacon. Lots of it. More on that later. As I entered the corner building I wasn't struck with a sense that the place was ridiculously old. I mean, it opened in 1913, so it's old. It just didn't seem too old. Which is good in my book. I like the charm of a place that hasn't been updated since the 20's but I can't help feeling like it isn't up to code food preparation-wise. It's that damn germophobic thing again. Either way, I felt safe. The decor spans the decades which is maybe why it doesn't feel like a certain era. Crown Candy Kitchen isn't large by any means but there are plenty of tables, almost always full of people from what I understand. Today was no exception. I arrived before noon which must have been a good plan because I immediately scored a table. Shortly after, the line to sit down was out the door. I was there to get one thing in particular... The famed Crown Candy shake/malt. I wanted to decide on that first. I'm still second-guessing myself on the choice of Coffee flavor with so many good choices, but the real trouble was what to eat. I was planning on ordering the BLT which many people had recommended until I began to look around the joint. It was obviously the most loved sandwich there as many people were munching on it. However, what they were eating looked nothing like a BLT that I'd ever seen. These weren't BLTs. These were bacon sandwiches. I've never seen so much bacon served to a person. I get it, people love bacon, but damn. I like bacon to an extent but nowhere near that much. I passed on the BLT. So what did I get? A turkey bacon sandwich. Why am I an idiot? Because it's a BLT with turkey on it. 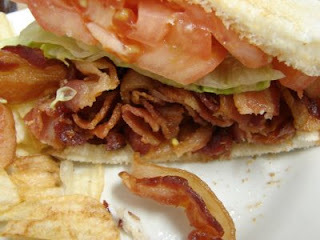 There was less bacon than the regular BLT, yes, but I still had to remove quite a few slices of meat candy. Thankfully I had my delicious coffee shake to wash the salt down with. When you order a shake they bring you out a gigantic metal cup that they make the shake in and a regular sized shake glass. From there you pour the shake yourself. That metal container holds about 4 shakes. Yeah, its large. And delicious. Nutritious? Well... No. They clearly state on their menu that their ice cream is made with 14% butterfat. While delicious it has no business being included in a healthy meal. Luckily you don't go to a place called Crown Candy Kitchen for healthy meals. Here's the question... How unhealthy is it? Let's compare the shake to an Oberweis Vanilla Milkshake. Oberweis uses 18% butterfat in their ice cream according to their website. That's a decent amount more I'd say. Now lets take a look at some nutritional assessments... Wow. 1080 calories. 72g of fat. 97g of carbs. That's for the serving size of "1 shake" whatever that means. You'd guess that Crown Candy Kitchen's shake would be a little less horrible for you until you realize that the serving size of these shakes there is massive! Who knows the number of calories and such are in there, but if you are drinking the whole thing like it begs you to do, you're likely going into a coma. Guess, what I did as soon as I got home? 2 hour nap! So yeah, be prepared. You are likely getting a whole days worth of calories when you go there. A whole delicious days. The place is totally worth trying at least once. I know where I'll be bringing my Chicago peeps next time they visit. They love bacon. Soulard Farmers Market In Ruins! 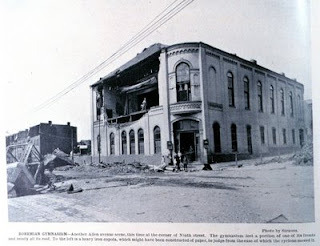 The tornado first hit the ground along a ridge in the southwest portion of the city, near the St. Louis State Hospital ("City Hospital"). It next went along Jefferson avenue, through Lafayette Park to Seventh and Rutger streets. Then it moved on towards Soulard and the levee before crossing the river on towards East St. Louis in Illinois. In its wake, the storm left atleast 138 dead in St. Louis, another 118 in East St. Louis. Approximately 85 persons were missing in St. Louis and over one hundred more missing on the east-side. Many of those listed as missing were certainly killed and their bodies either carried away by the wind or by the river, with little hope that the bodies will be recovered. 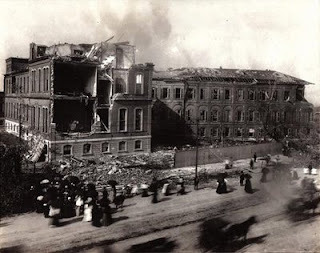 Over a thousand residents were physically injured. 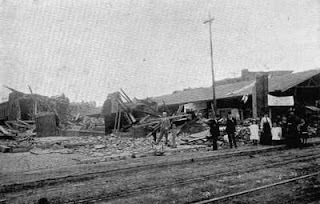 The "Cyclone of 1896" has been described as the single most deadly event that hit the St. Louis area in recorded history. In little over fifteen minutes the storm fully completed its course of death and destruction. Yeah. That's some pretty serious disaster. That's an excerpt from this awesome website accounting much of the disaster with tons of pics. Apparently this was a pretty big deal at the time too. There were songs written about it the lyrics of which can be found on that website! Although it does seem like there were songs written about everything back then. I think my favorite of the era was "Uncle Josh In A Chinese Laundry" by the unforgettable Cal Stewart. I think he won American Idol that year. I'd check, but who cares? "Do Not Swim In The Mississippi River"
That's a tip I just received from a gentleman upon learning I was new in town. It was said without a hint of sarcasm. Apparently, despite the swift moving current and spattering of debris, one may be tempted into jumping in for a swim. Don't. I know it seems appealing on this balmy 70 degree day, but I've been told otherwise. Anyway, back to my irrational fear... In case you missed it in a previous post, I decided to let the world know that I generally dislike being in large bodies of water because of my very near crazy thought that there are dead human bodies in them somewhere. Yes, it is ridiculous and it doesn't really stop me from going in the ocean per se, but it definitely sits in the back of my mind. I think it has to do with the decomposition and dead people juices. That just doesn't sit well with my very slighty germophobic nature. It also doesn't help that they were always pulling bodies out of Lake Michigan on the Chicago shoreline and closing the beach because of high levels of bacteria. So yeah... Gross. 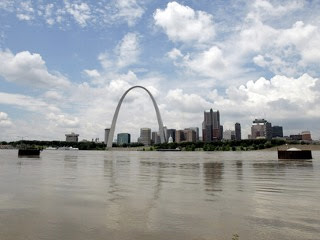 Now all this "swimming in the Mississippi" talk has me wondering how often they pull people out of it here in St Louis. To the magic Google machine! Wow! The first one on the list just happened on May 3rd. The dude was found wearing a T-shirt and a robe at 2 in the morning. It seems doubtful he was going for a swim. Could the Mississippi River actually come and take you in the night? Haha... No, no, that would be silly. Let's read on. Oh, he seems to have been strangled. Hmmm... that seems suspicious. Wait a sec... Old Man River? Damn it, he's done it again! You know that Seinfeld episode where Kramer adopts part of the Highway and repaints the lanes so they're wider and more "luxurious"? That's what driving in St Louis is like, sans wider lanes. Now, the Chicago boy in me wants to talk about the "expressways" here in St Louis, but I'd be breaking St Louisese (the native tongue) law by calling them that. No, here you drive on highways. What's the difference between I-70 and, say, Highway 67? Nothing if you're going by descriptor. They are, in fact, both highways. Yes, I-70 is more "express" than Highway 67, but who am I to argue? They don't use it. So there. That said, there are only a few things that have gotten me riled up. Now I'm a fairly calm person and road rage is not something I'd consider to be in my repertoire, but man alive what is with the traffic lights here? In the county, where most people live (it's the St Louis suburbs), the lights are fine. You never wait an overly long time. But try driving in the city at night. First of all, unlike Chicago, the city is fairly empty at night specifically around downtown. You can drive right past Busch Stadium and down Market Street and literally not see another car after 9 pm. So that's why it's so frustrating when you pull up on a red light and sit there for over a minute while not one car enters sight. And almost all the lights are like this. Timed. Not for the time of day, but for when the streets are at their busiest... Rush hour, Cards games, ...actually that's about it. Any other time and you're counting down the seconds you could be using to think about interesting blog posts. Yeah, you could think about something like that right then, but you're driving. Defensively, I hope. You really should be keeping your eyes on the road. I know what you're thinking. "Well if no one is around why not just go through the insanely long red light?" That's a good question and something you should have really thought about before you asked it. Running red lights is dangerous. Annnnnd St Louis already thought of how to thwart your bad judgement. 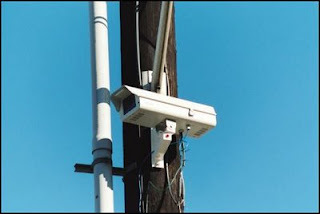 They have installed cameras at each intersection. You can still go through the red light if you want but be sure you're it's on a day when you don't have a huge zit. That would be so embarrassing when you get the picture in the mail. You just know the clerks down at City hall would have a good laugh at your complexion mishap. Oh the times I bet they have! Here's the best part of this whole traffic thing. They have a major highway closed right now. I-64! 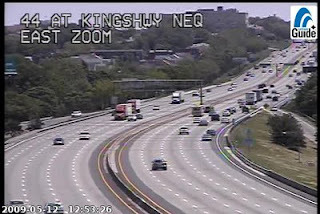 Yes, a whole major interstate is completely shut down and yet the traffic still flows. I can't wait to see what's in store for my travels once that bad boy opens up in December. I'm going to totally drive somewhere. UPDATE: Sorry about the font size here. Blogger has been... Well, I don't need any more trouble so I'll leave it at that. UP-UPDATE: Fixed it! HTML and I have grappled and, once again, I win! One Saturday night, not too long ago, I met up with a friend who was going to show me some of the cooler places in St Louis. I had met her through buying tickets to that Matt & Kim/Cut Copy show back in the day and we struck up a nice accord as the cash and stubs were being exchanged. Just on that short encounter I knew she could point me in the right direction, fun-wise. I realize I'm setting this up as an Adventures In Babysitting type crazy night, but I can assure you there were no tire-blowouts or accidental car-theft ring exposures. I may or may not have had to sing the blues to exit a building. We began the night by checking out a photography exhibit in a bit of a tough neighborhood. This, in fact, could have been a great Adventures In Babysitting start, but it was uneventful. We were only there for about 15 minutes before leaving. It was a small exhibit but the prints were excellent. St Louis has loads of great photo opportunities, by the way. If you're out-of-state and you plan on visiting don't forget your camera. Next stop... Bar. A short drive to Kingshighway (yes, it's one word and, no, it is not pronounced king-shigway) brought us to The Royale. While I didn't get a chance to enjoy their food, there is a definite liberal/healthy/Obama vibe there. First of all, it's non-smoking which is a big plus for me. The atmosphere is relaxed while at the same time being upbeat and friendly. It's a perfect "chill" bar. You know... where you don't have to yell over the music. Like I mentioned, I didn't get to try the food, but I did see the menu and it was right in line with what I enjoy. Bar type food made fresh and with an eye for healthy living. Fried foods were kept at a minimum and there were even some selections for our Vegan friends. Hi Vegans! You're totally missing out on yogurt. There's probiotics in it. Anyway, I was impressed and do want to stop in for lunch sometime. They also seemed to have plenty of cool events planned. Just checking their well updated blog and I see they had a Kentucky Derby party. Hey... 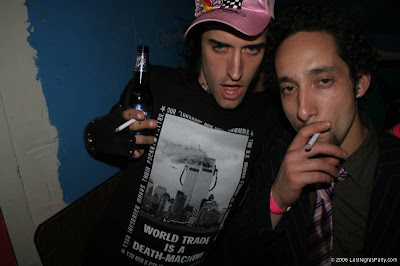 I like parties. Their beer selection was fine too. Although I was disappointed to see they didn't have any Boulevard Wheat it gave me a reason to try a few beers I'd never tasted before. One of these, and I forget the beer unfortunately, was at least 9% alcohol. It was excellent tasting, but I'm sorry to say I paid for it the next day. If I could only bring Bouly Wheat with me everywhere... We left as a DJ was just starting his set. He was playing some decent stuff and at the perfect talkable level. High marks for The Royale! Next stop was London Calling at The Stable. The Stable itself could be a post on it's own. First of all you should know that it's located in the old Lemp Brewery stables in Benton Park. They do brew their own beer and distill their own liquor there. They also make a pretty good pizza which is high praise from a self-proclaimed pizza connoisseur like myself. The star, however, is the atmosphere which is comfortably old. You feel the history of the building as you enter. It's been modernized and updated of course, but there's enough preserved characteristics that you know the place is old. Upstairs is where London Calling takes place. It's normally closed off when there are no events taking place and that's too bad because the second floor is awesome. There are multiple rooms and bars and the larger of the rooms is highlighted by massive steel weblike rafters. Perfect for this type of party. And that's what London Calling feels like. A huge party. They have a DJ's playing dance music in both rooms. One room is prominently New Wave type rock and the other is mostly Indie electronic. Either are awesome and I went back and forth between the often depending on my 9% alcohol beer induced mood. Oh! And they have Boulevard Wheat there to my surprise and enjoyment. Anyway, the electronic music room also had most song's videos being projected on large screens which makes for some awesome shadow puppet opportunities. The crowd itself was uber-hipster and mostly extremely friendly except for a few people obviously taking themselves way too seriously. Don't worry. The only weapon these hipsters carry is an extreme douchebag stare. This is usually characterized by slightly raised eyebrows and pursed lips and is not to be confused with either the "stink-eye" or the "Elvis." Generally they keep to themselves and only use it when cornered or provoked so, again, don't worry. This is also a great place to people-watch as it seems some people get very dressed up for this. Almost costumed. I think next time I may use this as an opportunity to wear whatever I want. Finally, an opportunity to wear that mesh half-shirt I've been saving since 1991. What? That's what everyone wore to play football back then! I think. And hey! It's open till three! I'm old, unfortunately, and 1:00 AM is latest time I can remove my dentures before they begin to hurt. Still, leaving then felt like I'd been there forever. I, quite figuratively, danced the night away. Luckily the London Calling managers are smart enough to only do these every other Saturday. I'm reminded of the old "too much of a good thing" proverb. Again, I must give high marks for this place too! If you're into Indie music or hipster culture this is your party. And that was the night. Like mentioned previously I had a tough morning, but I wasn't regretful. 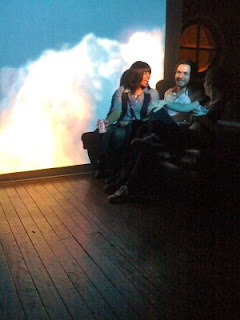 That was one of the finest nights I'd had in St Louis so far while not hanging out of the slanted roof of a building. Don't eff with the Lords Of Hell. What? You were looking for one of my lame attempts at a title? Sorry, I've been reserving them for weird Facebook status updates. And/or I couldn't come up with one. I'm going to let a jury of my peers decide on that, but first, let me plead my case. How the hell do you describe City Museum? If you haven't been there and you're looking for what type of experience you might have - do not continue reading this. None of the following will make sense. I've tried to explain what it is when Chicago friends come to town. I usually just end up sputtering a series of umms and ahhs. And then I say something along the lines of, "Well, it's not really a museum in the 'traditional sense'..." Undeterred, they usually stare at me for more info and that's when I just leave it at, "There's a big slide." And there is! It's gigantic, but I'm getting ahead of myself. 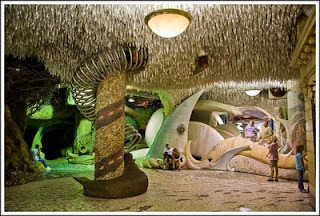 What you need to know about City Museum is that it's like a gigantic unguarded playground of weirdness. You pay the ten bucks to get in and then you pretty much have the run of the place. What you have a run of is a bit harder to describe. It's like being dropped into a real-life cartoon. And you know how what happens in cartoons would hurt in real life? Yeah, there's that danger there. And maybe that's what makes it so fun. Kids are allowed to run free and many of the nooks and crannies only an 8 year old could fit in, but it's certainly not for kids. I will say you do have to be fairly athletic and retain some childlike imagination to have fun. You definitely can (and probably will) get hurt. But isn't exploring a cartoon world worth it? Excuse the cartoon references because I would guess that's a little misleading. There are parts of this place that are very industrial. Specifically the gigantic spiral slide. This building is at least 10 stories tall and in the middle of it is a gigantic open space with dozens of these steel twisty slides and stairs. At first glance none of it makes sense but it can't be any more impressive as your eyes follow them skyward. This building originally was a shoe factory in the early 20th century but I'm not completely sure these were used for manufacturing. They certainly look original... Either way they are perfect for sliding. If you can climb all the way to the top ( I run and it's a little bit tough) you can take one of those spiral slides all the way back down to the bottom. It's quite a ride but keep your hands and feet close to you. I bruised my knee up nicely the first time. Then I went again. The outside is even crazier. There's a whole industrial playground to explore that includes a castle of some sort, old airplanes, and wait for it... a Chucky Cheese style ball pit... for adults! Add a giant blow-up moonwalk and I could finally realize my dream of being a 9 year old for the rest of my life. I choose 9 because that was how old I was when I could ride my bike as far as I wanted. That way my adult 9 year old self would still be able to go to the grocery store and such. The German word for rabbit is "Hassenpfeffer" = Awesome! I've sold 2 copies. One to my Mom and the second I bought as a birthday gift to my dog, Oscar. Anyway, this post has gone decidedly off topic. Let me leave you with this... If you want to see some craziness, go to City Museum. I can't imagine you'll be disappointed unless you hate seeing things that make you think, "I can't believe they are getting away with this." 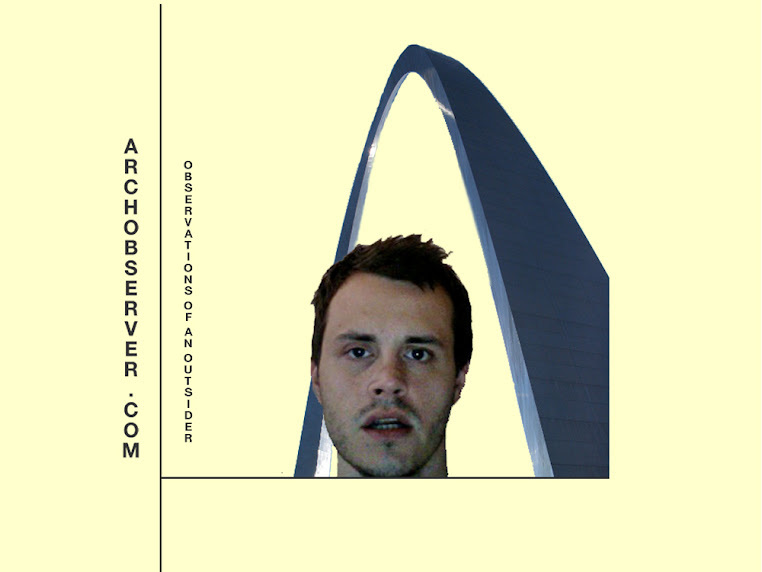 If I were to declare something a St Louis treasure, so far, this is it. Fine, jury of my peers... I couldn't come up with a title, I admit it. But come on, you can't describe it. It's like a real-life Alice in Wonderland injury factory in there. Hmm, that actually wouldn't have been too bad.